Larry D. Spears writes: It's often said the stock market can deal with anything but uncertainty, but uncertainty is about all the U.S. stock market has to feed on these days - and that has translated into raging volatility and huge swings in both the major market indexes and the prices of many individual stocks. Day-to-day swings of 250 or 300 points are becoming almost commonplace - and the direction those swings will take is an ever-growing mystery. Just look at the Dow Jones Industrial Average as a case in point. Since late February, the Dow has climbed from 10,325.26 to an intraday high of 11,258.01 (on April 26), plummeted to an intraday low of 9,869.62 during the May 6 "flash crash," rallied back to 10,896.91 on May 12, dived to just 9,774.48 during the day on May 25, closed below 10,000 for several days in early June, and vaulted back up above 10,170 at the market's close on Thursday. Straddles can be executed with options on market indexes or on individual stocks, as well as on numerous other assets, including commodities, futures and currencies. 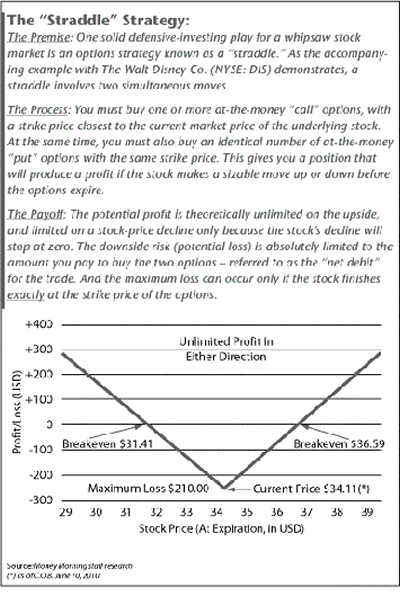 For the sake of simplicity, however, I'll describe the play as it's done with options on a single stock. •Simultaneously buy an identical number of put options with the same strike price (meaning they are also "at the money") and having the same expiration date. This creates a position that will produce a profit if the underlying stock makes a sizable move in either direction prior to the date on which the options expire. (In the case of standardized stock options, this is always the third Friday of the expiration month, barring market holidays.) In fact, the potential profit is theoretically unlimited on the upside, increasing so long as the stock continues to climb, and limited on the downside only by a drop in the stock price to zero. By contrast, the risk is absolutely limited to the amount you pay to buy the two options - referred to as the "net debit" for the trade - and the maximum loss can occur only if the stock finishes exactly at the strike price of the options. To clarify, let's look at a recent example. The Walt Disney Co. (NYSE: DIS) had been trading in a tight range between $32 and $29 for most of January and early February, closing on Friday, Feb. 5, at $29.54. However, the company was due to report earnings on Tuesday, Feb. 9, and it seemed likely the news might break the stock out of its tight range. But which way? A trader who wasn't sure, but wanted to make a play anyway could have positioned himself for a move in either direction by opening a March $30.00 Disney Co. straddle on Monday, Feb. 8. That would have involved buying a March $30 Disney call option at a price of around 65 cents ($65.00 for the full option, which represents 100 shares), and simultaneously purchasing a March $30 Disney put option at about $1.15 (or $115 for the full contract). The net debit, or cost, for the entire position, using a single put and a single call, would have thus been $1.15 + $0.65 = $1.80 x 100 = $180.00 - and that would also have been the maximum risk on the trade. One point that's worth noting: As is true of individual stocks, options vary in price each day. So it's hard to specify an exact price. As a result, when ordering a straddle you shouldn't try. Instead, use a combination order that specifies the total net debit you want to pay - which in this case would have been $1.80 - rather than the individual option prices. As it turned out, Disney's earnings were slightly better than expected and the stock joined the rest of the market in a steady climb higher over the next five weeks. By the time the expiration date rolled around on March 19, Disney stock stood at $33.64. That meant the March 30 put option expired worthless, but the March 30 call had a value of $3.64 - the $33.64 stock price minus the $30.00 strike price = $3.64, or $364 for the full option. The trade thus netted a profit of $184.00 ($3.64 - $1.80 = $1.84 x 100 = $184.00). That was before total commissions of about $30. That may not seem like much, but the net gain or $154 represents a return of 85.5% on the trade - in just over five weeks. What other investment can you make that will give you a return in excess or 80% - even though you didn't have a clue about which way the price would be heading. I also picked the Disney trade because it illustrates a couple of other points that are worth noting about straddles. Though the straddle is a favorite strategy of high-risk traders in the volatile options on indexes - such as the Nasdaq 100 (NDX and QQQ options), the Russell 2000 (RUT) and the S&P 500 (SPX) - as well as on high-priced and ultra-volatile individual issues, it can also produce nice gains on fairly modest moves by nearly any stock priced over $15 or so. It can also be held over differing time frames. For instance, you could hold the straddle for a day or two (or less) for index options, or for high-volatility trades. Or - for more-stable, trending issues - you could hold the straddle for a couple of months. With the latter, of course, you aren't required to hold until expiration if you get a big, profit-producing move right away. You can just sell your options early and pocket the cash. One caveat with respect to longer-term straddles: You probably shouldn't hold over more than two options-expiration dates - especially in this market - because a reversal can quickly wipe out early gains. That would have happened with Disney had the trade been done with May options rather than March - after climbing all the way to $37.98 in early May, Disney stock retreated to just $32 by the May expiration. Besides, in markets as uncertain as these, there's no need to reach out too far with your options, since new opportunities arise almost every day. In fact, a June Disney straddle could have been done last Thursday (June 10), buying the July 34 puts and July 34 calls at a net debit of $2.59, when the stock was priced at $34.11. That trade would have enjoyed the profit/loss scenario depicted in the accompanying graphic. And, actually, you don't really have to wait for uncertain or highly volatile market conditions to use a straddle. You can key the positioning of a straddle to upcoming news events, such as the release of earnings in the Disney example. Good or bad, the stock is likely to react to the news, giving you at least a modest profit - though not always the way you expect. Recently, many better-than-expected earnings reports have been followed by large stock-price declines - Ford Motor Co. (NYSE: F) being just one example. Other price-moving news events you may want to watch for include items such as announcements of patent approvals, Food & Drug Administration (FDA) rulings on new pharmaceuticals, pending product recalls, or other substantive announcements. If you want to take the time to learn more about options, how they are valued and the impact volatility has on their prices, you can also find good straddle opportunities by looking for undervalued options or periods of low volatility. If you position a straddle under such conditions and volatility subsequently rises, you could profit on both sides even if the stock remains unchanged. The extreme volatility of the past few months - including the "flash crash" on May 6 and several other 200- to 300-point intraday reversals ­- has proven that. Premiums for options on many stocks are more than double what ones with similar lifespans and proximity to underlying stock prices were just two months ago. One final point: Spotting overvalued options can, of course, be a signal to "sell" straddles rather than buy them. That's a procedure we may come back to in a subsequent Money Morning story.